Only a few months behind schedule…. What is this you speak of…..curriculum. I open it and read it and am instantly in tears. 4 years ago I attended a workshop held by Jo Boaler at CSU-San Marcos (which I had paid on my own dime). We had to write this letter to ourselves. I apparently knew how frustrated I would be being out of the classroom for so long. I am still frustrated but this letter reminded me that maybe I should be looking at other options. Maybe back to school? or a location change? or maybe a break from education altogether? Hopefully, the universe sends me more signs soon. Today is #NationalComingOutDay. I thought it would be a safe time to share a quick story. Two years ago, I met a woman who changed my life forever. I had never (and haven’t since) experienced such a connection with another human being the way I connected with her. She was the first woman I was physically, emotionally, and mentally attracted to (and still am). I never knew that I liked women as much as I do men. And this woman introduced me to a world that I feel the most comfortable being a part of. I am officially announcing that I am pansexual. #TMC2015 Better LATE than NEVER! So I’ve been hesitant about writing this one. Not because I didn’t have an awesome time or because the time wasn’t well spent but because this time around I put myself in positions to really push myself personally in order to push myself professionally. I’m not all that open about who I am in my personal life and this year’s conference put me in a place where I had to start doing that. To start it all off I got to pick up my favorite and amazing colleague Mitzi Hasegawa at LAX. While we were there we also picked up two more hitchhikers, Teresa and Megan. Chatty filled drive to the hotel to drop off our cargo and then get settled in at our adobe for the week (Mahalo Judy!). It started Wed night with game night! What fun that was! I loved the environment of being able to mingle and just walk around, make new friends and also tackle hug old friends. Thank you to all who helped support this night of casual fun! Go to meet and work with lots of new stars that I chat with often on Twitter. Had great convos around K-Calc progressions. How and where to make connections and building ways to use models that span K-Calc content/courses. 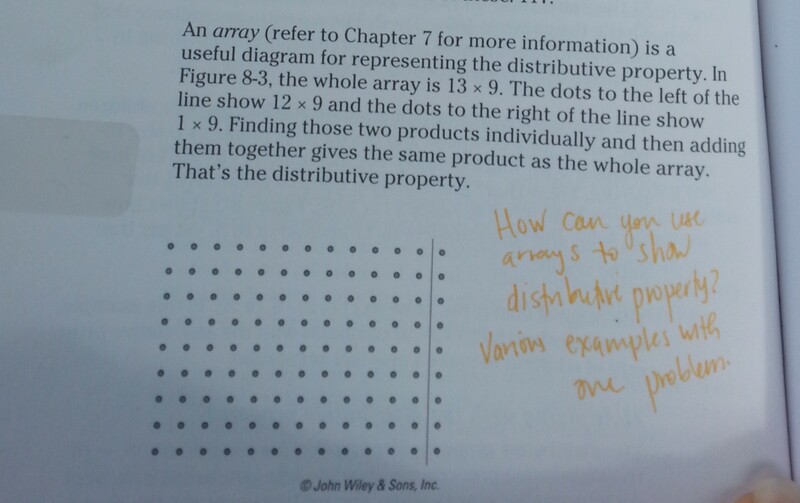 For example: equivalence, distributive property (models for this), proportional reasoning, and much more. Conversations were rich, thought provoking, and challenging. I’ve reflected on and thought a lot about the structure of the morning session. One of the greatest things about this special session is we get to work as a group for 3 solid days on a big idea and actually produce some kind of product. This doesn’t happen at any other conference I’ve attended and I very much love the focus this allows us teachers to have on improving our craft of teaching. Mahalo again TMC team for this special morning session! I don’t need to say much about her because her work, book and research pretty much speak for her awesomeness! LANI HORN!!!! How amazing is she!!!!! Biggest take away for me from this talk was the discussion around classroom ecology. The huge dynamics of classrooms and how these dynamics affect our teaching and students learning. No joke I am still processing this information. 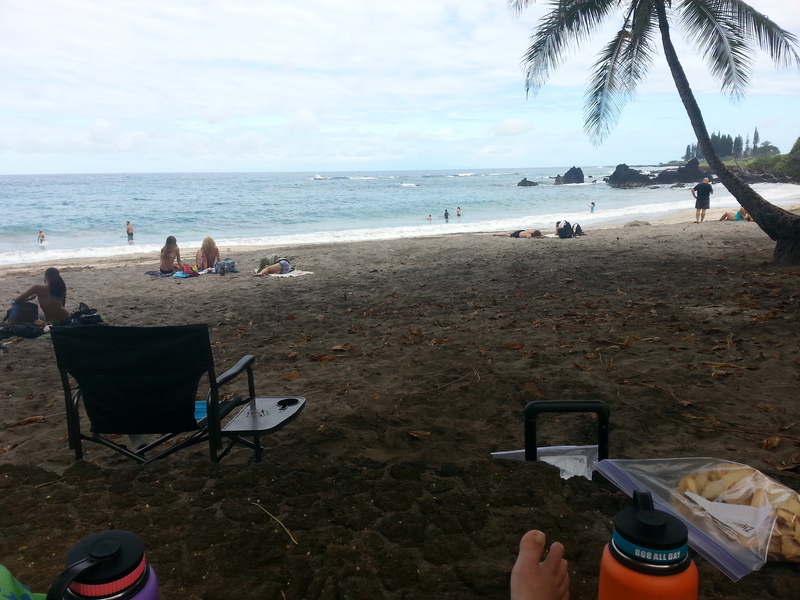 All I have to say is MAHALO to Megan for opening this up to me. I needed this personally. I cried my eyes out and totally pushed myself in so many ways at this conference starting with this session! Not enough thanks to you Megan! I was VERY nervous about this 30 min session I came up with on a whim by an idea John Golden gave to me on the day of the TMC submission deadline. I had no presentation, no handouts, NOTHING! I had 7 measly index cards with norms, some guiding questions and a closure statement. As more and more people filed in to be in my session the more nervous I was!!!!! I mean people…..IT’S 30 MINS OF TALKING!!! YOU DON’T WANT TO COME HERE BELIEVE ME! Everyone proved me wrong! So many great stories were shared. Memories of students and the weird stuff they do that drives us crazy but we also can’t live without. Those quirky awkward moments that stick in our brains forever. These experiences only allowed to us because we take that crazy, psychotic decision to get paid less for more work, to be a 2nd parent, to have our lives consumed by these part human, part teenager alien students that we absolutely adore and could not see our lives without. Therein lies the one of a kind experience that this profession has to offer and we got to honor that for 30 mins and take the much needed time to celebrate ourselves and our profession. Mahalo to everyone who attended. I am humbled by your commitment and passion! Mahalo Christopher for reminding me about what which I am extremely passionate about…..TEACHING!!! Mitzi and I were excited to share out ideas. We think it went really well. We haven’t kept up on what we said we would provide for our attendees yes but I am hoping to catch up with that soon! Sorry everyone! This session was kind of amazing! I loved how this session deliberately addressed the needs of students. The big idea was using workstations to make sure students had the previous knowledge before new learning was introduced. It was very intentionally planned to addressed previous knowledge needed in order to get to the new content that needed to be taught. Plus Michelle had some of the best cat videos! Very fun, social, great food, and hosted by amazing, loving people! Mahalo Jed, Matt, John, all their families, Mathalicious and the many others involved to get this event planned and happening! There are no words to describe Fawn’s session. I didn’t get to finish watching this whole presentation because I had to drive to the airport to fly home but the half of it I was there for I laughed, cried and was reminded what a strong role model for students should look like. I mean the woman has come so far personally and the way in which she leads by example is the most humbling. I only wish that someday I’ll be able to be that role model for my students. Fawn you inspire me to be a better me every single second of my life. Mahalo for all the inspiration. My TMC journey this year was an emotional rollercoaster. However, it was time for me to be challenged in a different way than I have been putting myself in. I am ready to go forth and take my learning journey with me. Mahalo everyone for the great experiences, conversations and memories. See you next year TINNISOTA! Well I’m back with another recommended resource book I just finished reading. 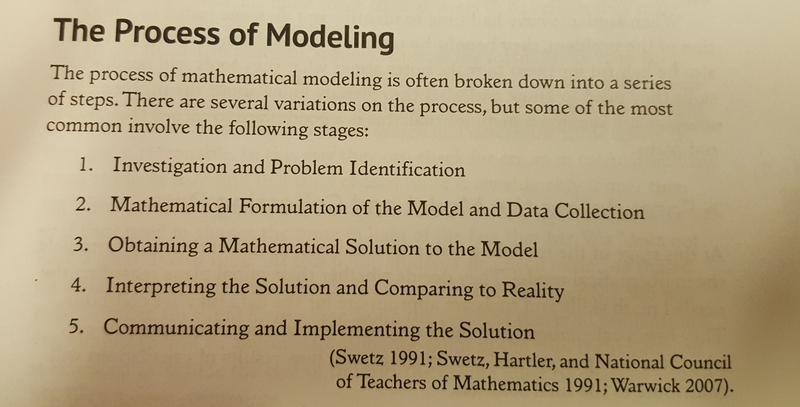 So when I saw Modeling with Mathematics by Nancy Butler Wolf and learned that it was for middle school (maybe some HS) I jumped on the opportunity to read this bad boy and start figuring out a solution to a problem in my classrooms (instead of playing the BLAME GAME of course). The #1 thing this book has is great tasks you can use with your students. There is the infamous Barbie Bungee task in there but there’s also a lot more tasks that can be used right from the book without modification (there is also room for modification too). 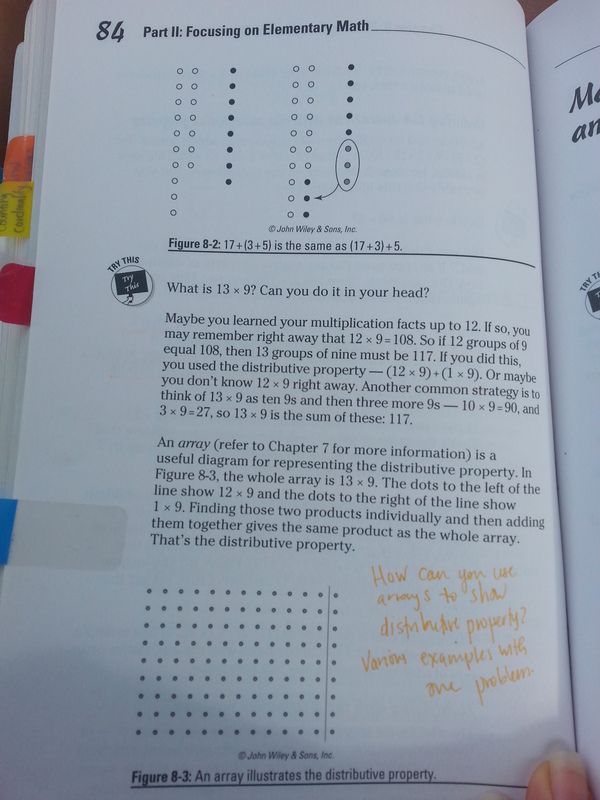 Something I really love is how the author points out what makes a task a modeling task and goes further to even compare the difference between word problems, problem solving and modeling problems. This helped me to see clearly the definitions because to be really honest I’m not sure I really knew the difference with as much clarity as i do now. Majority of the book is dedicated to the process of modeling. There are chapters that refer to each “step” in the process ad those chapters go into detail what you as a teacher do to help facilitate the process with students. There are short vignettes that give examples of conversations between student and teacher which totally helped me to make sense of how to facilitate this scary modeling process. 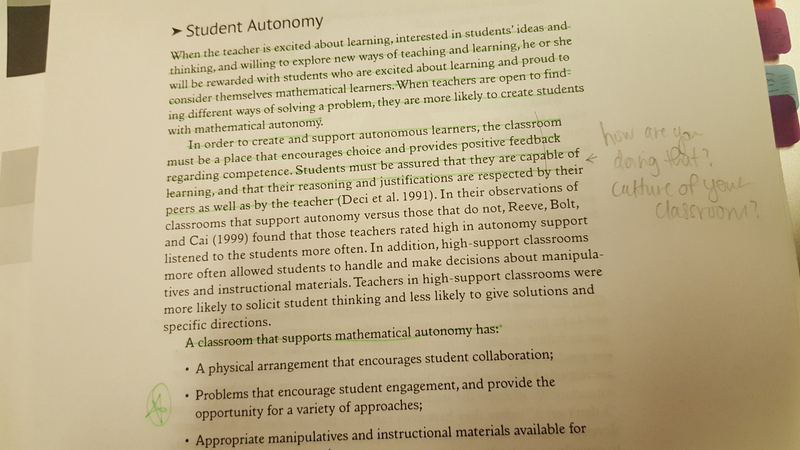 My favorite part of the entire book however was the section about Mathematical Autonomy. I had to stop myself from highlighting the entire section!This part spoke to me because it was really about classroom culture, being student centered and allowing students to be leaders in their own learning journey. This is one of the biggest struggles I see with teachers in classrooms (even in my own): How to build a truly student centered classroom environment where there is respect from all parties involved in the class. This resource would be great in your classroom if you’re like me and was (past tense because I feel a bit more confident now) intimidated by the idea of integrating modeling in your class. She provides a framework to move through and lots of ideas of how to start having students engage in modeling. It’s scary but the thing that the author says about modeling is it is the way to get the best bang for your buck! So go out and read it and then come back and let me know how you liked it and use it in your classroom! My Student Learning Objective or School/System Improvement Objective (SSIO) this year was to add on to the K-2 bank of resources I created last year. Everything in that previous post still stands. I am still worried about all those things however I still want to share these resources so that whoever might have a use for them does. Feel free to leave comments about mistakes or updates that should be made to them. I hope to continuously update these as I continue to use them while working with teachers. My main use recently for them is for finding workstation activities focused around a certain cluster. That way the work station game can be used over for a longer period of time and address multiple standards throughout the year. A Useful Reference for ALL! 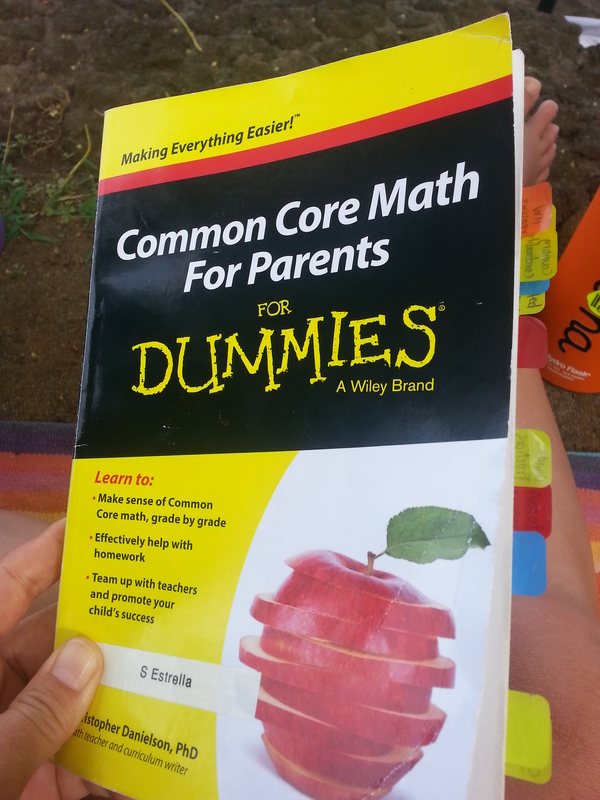 I finished reading Christopher Danielson’s (@Trianglemancsd) Common Core Math for Parents for Dummies book just yesterday. It took me a while to get through it, which I think was partly because it wasn’t the most intriguing read for me. Now that doesn’t mean I think this book is horrible! Instead I think the EXACT OPPOSITE! This book is a GREAT resource for anyone with kids or teachers grades K-12. Now, I am a certified 7-12 mathematics teacher but that doesn’t mean I know the ins and outs of all things math or even the Common Core State Standards-Math (CCSSM). That is why I recommend this to all K-12 teachers (that teach mathematics) and especially parents! Yup there are A LOT of tabs on that book! 11 to be exact. As for parents, you should read this resource to help you get a better idea of the how and why of what your child is learning in their math classes from grades K-12 and how you can help support a positive journey through learning mathematics. As a resource teacher when I’ve worked with grade 3-5 teachers I’ve had teachers ask to have “training” to learn where their teaching of math gets applied beyond their 3-5 grade band. After reading this book, I can see using this resource to provide a 1 day training, maybe even an ongoing book PLC where grade level teachers (K-8, maybe 9-12 too) could brush up on their grade level content standards. In addition, teachers would engage in a conversation about how to approach teaching their grade level standards knowing where a standard comes from and goes to, previous grade level and post grade level. This discussion is rooted in the Coherence shift of the CCSSM. Other conversations that could be fostered, would be around the Standards for Mathematical Practice, domains of the CCSSM and/or specific topics that span CCSSM: linear equations , functions, arrays, etc. This structure would work well for a course that would help teachers engage in the understanding of their content standards and span across a few sessions. This would help teachers expand their knowledge of math beyond their grade level and feel more comfortable teaching at their grade level knowing where their students’ learning is coming from and going to. I jotted a note in relation to a model and how might a teacher use it to teach a related topic. Allowing teachers to make connections between concepts within their grade level (horizontally) and between grade levels (vertically) addresses the Coherence shift again here. Lastly, MAHALO Christopher Danielson for providing us with a great resource to help support positive math teaching to students. A Course Idea, Feedback Wanted! So I am at it again! I want to teach another course. A different one from my last one (although I will be offering that same course again next year). I want to offer this new course for professional development credit, so that teachers will be able to get something back from their hard work. And I also want to pack the course with serious learning and requirements!!!! I’d really love feedback on the course. If you want to leave comments directly in the doc. Email me your google accounts and I’ll add you on as commenter. If not go ahead and leave your comments below. Any feedback is greatly appreciated!